This is a writeup for Conquest-style scenarios in airsoft. Conquest is the iconic game style done in the Battlefield game series and systems like it are used in other similar games such as Day of Defeat. This is not a specific scnario, but an outline for basic rules with which to write scenarios. The driving idea behind this style game is to abstract a large conflict, representative of a massive number of troops for both sides, where the game is actually played with a relatively small number of players, roughly around 20+. This document aims to provide the framework for these style games in a manner that’s easy to setup and organize for airsoft. A team may win the game by one of two conditions. A) The other team runs out of tickets at of the spawn points they currently own. Note that players of the losing team may be still “alive” and active, but if their tickets are gone the game is over: They have run out of reinforcements and they are abandoned in the field while their main force is in full retreat. B) When the time limit for the game is reached the team with more “available tickets” is declared the winner. Available tickets means tickets at all the control points that team owns when time is called. In the case of a tie the team with more control points wins. If it’s still a tie then the game is a stalemate. Each team is assigned a color. Commonly red and blue, though any available color can be used. (Though assigning colors for teams and medics that are not difficult for color blind players IE: Red/green is a good idea.) These colors will be consistently used for each team’s armbands, (or other team markers) flags, ropes, and tickets. Medics are assigned an additional armband in addition to their team color which distinguishes them as medics. The medic color should be the same for both teams. A hit player is wounded. Wounded players may not move or talk beyond the exceptions allowed by the field. Living players may “move” 1 wounded player by maintaining body contact and leading the wounded player. Medics may heal 1 wounded player by maintaining body contact for 1 minute (recommended) where the medic does not shoot or move the wounded player. If this process is interrupted then it must be restarted from the beginning. A wounded player has a bleed out time of 2 minutes (recommended) that starts the moment they are hit. Wounded players may not respawn until their bleed out time has passed. Additionally wounded players must respawn if their bleed out time has passed. Wounded players may not begin heading to respawn until their bleed out time has passed. If a medic reaches a player before the bleed out time has passed they may heal the player even if the bleed out time is reached during the healing process. A wounded player who has at least been touched by a medic is not forced to respawn and may wait for a medic indefinitely. (They have been “stabilized” by the medic.) Note that this does not end the bleed out time. A player who was hit and after 30 seconds is touched by a medic, but not healed by them, must stay in place and may not begin respawning until the other 1 minute and 30 seconds have passed. Optionally, players may also be “stabilized” by another player moving them, instead of only by medics. This encourages players to recover dead players more and helps players not have to worry about counting their bleed out time while being moved. Control points consist of the following items. A bucket for each team containing unused tickets. A bucket for each team containing used (torn in half) tickets. A rope colored for each team. Deployment zones are similar to control points except they only have a flag and buckets for the team that owns them. Deployment zones have no rope on them because they cannot be captured. The deployment zone flag should be different than the control point flag so the enemy team will know not to try capturing them. (In the diagram above triangle flags are control points, square flags are deployment zones.) It is recommended that players be restricted from getting within 100 feet of enemy deployment zones in accordance with the usual “spawn camping” rules. (Note: These rules won’t be in effect at control points because control points are nearby spawn points. To respawn a player must return to a control point or deployment zone, take out one unused (whole) ticket of their team’s color and tear it in half. The player then needs to goto one of the spawn point stakes for the control point or deployment zone and touch it at which point they have respawned. If they are at a control point which is lost while they are positioning themselves to respawn the player’s ticket is still spent but they need to goto another control point or deployment zone before they may actually respawn. Spawn stakes will be placed nearby control points but away far enough away from the control point so players cannot instantly spawn and take out enemies capturing their control point, or vice versa, keeping players capturing a control point from camping enemies trying to spawn and defend their control point. Alternatively instead of “spawn point stakes” a distance may be designated from the point where they may respawn. In this case each spawn point has a minimum and maximum distance from the point that players may spawn at. The number of tickets for each team at each control point and deployment zone is set at the beginning of the scenario. Usually the number of tickets is the same for all control points, with deployment zones having a larger number of tickets than a single control point has. Control points with different number of tickets could be used to make a point more valuable for a team to own, could be used to encourage conflicts in certain areas, or could be used to represent that an area deep in enemy territory is harder for one team to control with one team having more tickets there than the other. To capture an enemy control point a living player must untie all the knots from the enemy team’s rope first. Once the last knot in the enemy team’s rope is untied the control point becomes neutral (players should take down the enemy flag) and no team can spawn there at all. 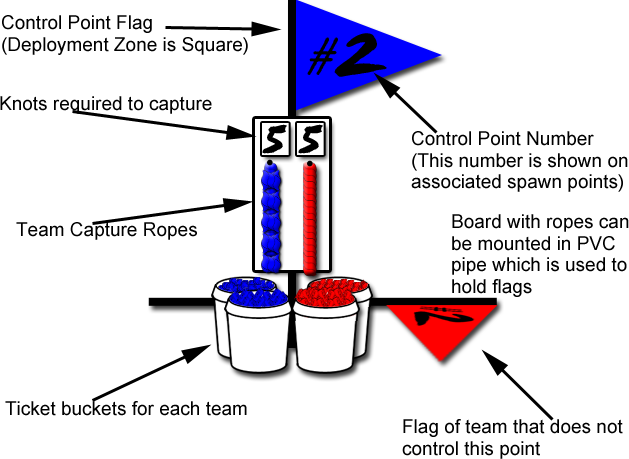 Then a living player must tie the required knots for their team’s rope to capture the control point, at which point they switch the flag to their color and then their teammates can spawn at the point. A player may re-tie knots in their own team’s rope, but may not tie more knots than the number allotted for that point. A player must always untie knots in the other team’s rope before they are allowed to start tying knots in their own team’s rope, and may never tie knots in their rope if there are knots in the opposing team’s rope. Alternatively it can be setup so points do not go neutral once a team’s knots have been untied from their rope. In this case players may keep spawning at the control point until the enemy team has tied their last knot and captured the control point, at which point flags are changed. This makes it harder to capture points because defenders may spawn at the control point for a longer period of time. The basic idea for the game is to require that a number of knots be set for each points which is universal. (For example, five knots.) However if desired each control point can be given different numbers of knots required. In this case each point will have the number of knots required posted next to that team’s rope. For example if a certain control point is more valuable then it may have a higher number of knots required for both teams. Or if a control point is close to one team’s deployment and it’s desired to represent the “home territory” aspect then one team could only need 3 knots on that control point while the other team requires 7 knots. Control Point #2 is neutral. A team must tie 5 knots in their rope to capture this point. A Blue player comes to the point and ties 5 knots in their rope, capturing the point and raising the Blue flag over Control Point #2. Blue players may now spawn at the spawn points marked #2. Later on a player from the Red team assaults the point and unties all 5 of Blue’s knots. They knock down the Blue flag and Control Point #2 is neutral again. Now no players may spawn at spawn points marked #2. The Red player ties 3 knots in the Red rope before they are hit and eliminated. Control Point #2 point is still neutral. A Blue player returns and unties all of the Red team’s knots and ties 2 knots in the Blue rope before they are hit and eliminated. The point is still neutral and no players may spawn at spawn points marked #2. After a pitched exchange a Blue player returns and ties 3 more knots into the Blue rope, capturing the point for Blue again and raising the Blue flag over Control Point #2 once more. Blue players may now spawn at the spawn points marked #2 again. A short while later another Red player assaults Control Point #2 and unties 3 of Blue’s knots before they are hit and eliminated. 2 knots remain on Blue’s rope so Control Point #2 is still owned by the Blue team. A Blue player spawns at one of the #2 spawn points, using 1 Blue ticket for Control Point #2, and reties 2 knots on Blue’s rope. The Blue player may not tie a third knot because that would raise the number of knots of Blue’s rope to 6, which is more than the number required for the point. Please direct any questions or comments on this to the comments section below. I’ll post an example of what a scenario using these rules would look like in the coming days.